I have worked with Docker for 2 years now, and while I know the fundamentals to create my own containers, I sometimes still struggle to understand how it all works and what is not “best practice” anymore. A friend of mine, Julian Fahrer, is a content creator for the learning platform LearnDocker.online. I was allowed to be a beta tester of the platform, so I could provide some feedback. So here is a review for you, if you are interested in professional training on Docker. Disclosure: I am friends with the content creator, but not affiliated with LearnDocker.online. I was allowed to freely test the demo version of the platform and decided to endorse it through this blog post. This is a professional course, for people who need or want to learn all about the Docker ecosystem. It is a paid course, and the pricing at the time of writing is $595 for individuals. What seems so much to me as an independent developer (and broke student) is worth thousand of dollars to your company or organization. You can learn all of the content on your own, of course. 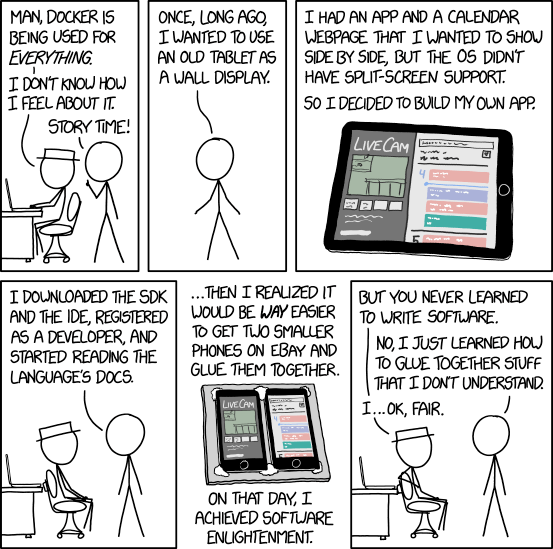 But it will take you way more time to read some free tutorials or the Docker documentation (which is not the most comprehensible out there). So, again: If you are a professional with money on your hands, but no time to dig through documentation and Stack Overflow for months, this platform is absolutely worth it. To use the platform, you need a GitHub account. The reason for this is not clear to me, but for many lessons, you can more easily access the repository hosted there, which contains the code examples. Also, the product is clearly targeted at developers, so expect an interactive course, where you need to follow along on your own machine. It is learning by doing, after all! The website is a web application and, to my surprise, even has a responsive design, so you can also use it on a mobile device. The platform consists of 4 major courses, from a short introduction to advanced Docker topics. Every course is subdivided into chapters, which contain the actual explanation videos. There are also quizzes at the end of every chapter, where you can test your knowledge after completing the lessons. The playback speed of any video can be changed, so you can speed up or slow down whenever you need to. Also, you gain points whenever you complete a lesson, which definitely boosts your ego! What I most liked about the lessons is that you have a “Notes” page for some courses that contain further links to the documentation, to code examples on GitHub and command-line entries that you can copy&paste. For the two main courses about Docker, there are over 100 video lessons. Fortunately, each video requires less than 5 minutes to watch, so the actual lessons are rather small. The audio is professionally recorded and the voice of the lecturer (which is again Julian Fahrer) is clearly audible. While he is German, his English is way better than most German politicians, so the courses are really easy to understand, even for non-native speakers. When a console window is shown, the text is mostly readable, but there are also Notes where you can review the commands used in the video. The actual content of the lessons is up-to-date, using the latest versions of the Docker API. On the landing page, they promise to keep the videos up-to-date when significant parts change. This is really necessary, as the Docker team often introduces experimental features and deprecates older practices (e.g. networking). As far as I could see, you also will learn about best practices (clean builds, correctly using the cache, etc). If you ever worked with a console and maybe even build a software yourself, you might already know what some beginner lessons try to teach you. You can then skip these lessons with a click. At this point, I can only recommend LearnDocker.online if you are going to build and manage docker-based services. Also, the advanced topics are also helpful for people already familiar with the basics of Docker. Kubernetes, Swarm, Compose and more tools around Docker are extensively used in production systems, so you usually will need to learn and use these, too. The one-time fee provides you with all the required knowledge, and I suppose you can get discounts for groups and corporate uses. Try the demo or get your money back within 30 days if you are not sure about it. And most important: have fun learning new stuff!